Halloween May Be Gone, But The Zombies Are Still Here! In our most recent newsletter, we outlined one of the biggest challenges facing the US economy going forward: the debt avalanche. 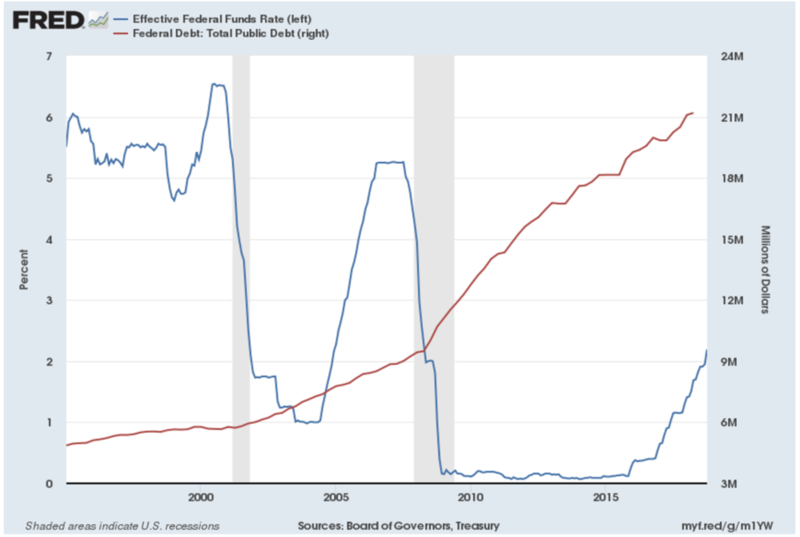 We pointed out the massive growth in Total Public Debt over the past 10 years as a result of the Federal Reserve’s zero-interest rate policy. This increased debt has the effect of adding to the snow-pack. Snow falls gently on the top of existing snow, building massive layers of snow upon an unstable foundation. Likewise, low interest rates allow for increasing amounts of debt to fall gently into the laps of millions of consumers, business owners, and investors. And while the debt appears serviceable on the surface, the foundations become increasingly unstable as the layers build. There is no better example of the massive debt increase and it’s increasing risks than “zombie” companies. That’s right, Halloween may be over but the zombies are still here! had an interest coverage ratio below 1.0 for the past three years. The interest coverage is the ratio of a company’s earnings to its debt interest. It basically measures a company’s ability to repay its debt. If a company’s interest coverage ratio is below 1.5, it is typically considered a very high risk. Most healthy companies have a ratio in the range of 2.5-3.0. In other words, a company that meets the two metrics above may still be open for business, but the writing is on the wall. What the BIS found was downright frightful! 12% of companies they reviewed could not pass this test. They are still ‘in business’ but essentially dead. 12% may seem like a relatively small percentage, but it isn’t. If 1 in 10 people in the world were zombies, I don’t think that would sooth anyone’s fears. When more than 1 in 10 companies are literally borrowing money to pay their interest payments, there is something fundamentally wrong with the economy. The snow may seem stable on the surface, but the sun is out, the slope is steep, and the foundation is ready to give way. 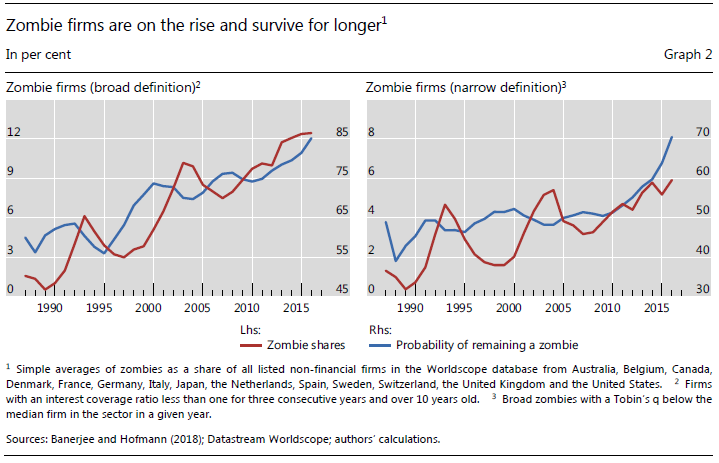 In addition, according to the study the likelihood of companies remaining zombies continues to increase. Back in the 90’s, about 60% zombies remained such for more than one year. In 2016, however, that number had jumped to 85%. So these distressed companies are increasingly living on borrow time (and money) for longer. And as interest rates increase, these companies will find it nearly impossible to survive. One of the disturbing things about zombies, as we all know, is there penchant for eating, well, everything. This leads to the other reason these companies are called zombies: their tendency to consume credit that would otherwise go to profitable companies. As interest rates have been suppressed over the last 15 years, and specifically the last 8, borrowers have seen their returns diminish as well. They no longer can loan money at 7-8% with little risk. As a result, investors take a lower return on their loans or lend to riskier firms that will pay higher rates. Not surprisingly, then, as interest rates have decreased the rise of debt-dependent zombie firms has increased. This has several rippling effects throughout the economy. First, it encouraged massive credit expansion to firms that should (and will, eventually) go under. Lenders are less likely to foreclose and take a loss without better alternatives available. So they will likely continue loaning to zombies in the hopes of a turn around. This not only increases investor’s eventual losses but it also diverts available savings (i.e. investments) away from productive companies. Secondly, zombies are often less productive than healthier firms, therefore decreasing overall economic productivity. And thirdly, it creates an environment where avalanches become prevalent. Take, for instance, the Tech Bubble in 2000 or the Credit Crisis in 2008 (shaded areas in graph above). When credit is offered to firms that should not be in business, it creates artificial and temporary growth that is unsustainable. Eventually these firms are flushed out in the form of higher rates of default and deeper, more severe recessions. Zombies always bring on an apocalypse of some sort. Societal breakdown, mass death, economic destruction, and near extinction. While the zombies we’re discussing are not likely to lead to such drastic results, their potential for wreaking havoc on the global economy is significant. In the third quarter of 2007, the percentage of subprime adjustable-rate mortgages were only 6.8% of the total mortgage market. Yet this relatively small portion of the market was a powder keg that set off The Great Recession. Today, at around 12% of the market, zombie companies are one of several areas of concern. It is important to note, however, that zombies are not the root problem. Rather, they are a symptom of the problem. In the movies, zombies don’t exist on their own. They are simply the consequences of mad-science, viral mutations, or chemical warfare. Likewise, zombie companies are only able to exist because of the ‘mad-science’-like experimental interest rate policy of the Federal Reserve. When supply and demand (i.e. the marketplace) determine interest rates, companies do not survive in a state of financial death. They will either produce, or fail. Whether or not this bothers you, I’ll leave you to your sentiments. But I want to make what I think will be a nonpartisan statement. When the big-screen zombies are allowed to die, I don’t see anyone complaining.